We have virtually every type of poultry and game imaginable at our fingertips. 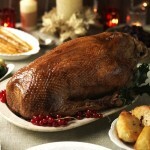 We have been buying from the same goose supplier for more than thirty years. His geese can be seen free-ranging in deepest Dorset until shortly before Christmas. They are wonderfully finished geese, of a quality far above that which you would normally see; and their flavour and tenderness is always superb. If you want to be different, why not spoil yourself with a goose this year? However, if a turkey is your bird, our turkey supplier produces a relatively small number of happy, un-intensively reared turkeys. They are plump, moist and tender, and again are really beautifully prepared. They also grow top quality free range Bronze Turkeys. They’re a bit more expensive and a bit smaller than ordinary turkeys, but they are slightly different from the norm, and maybe a bit moister. Those who had them last year thoroughly enjoyed them. We always hang our Christmas poultry to ensure its flavour and tenderness. It really is a different product altogether from the mass-produced bird, as those of you who regularly buy from us will testify. Turkeys, especially Bronze ones, are always in great demand. If any of you know what you are going to need in the way of turkeys, the earlier you order it, the more likely you are to get exactly what you order! Turkeys and geese are traditionally sold “long-legged weight”, however to make it easier for you we are doing it net weight after dressing from now on. If a goose or a turkey is too big for you, why not try one of our Barbary Ducklings? We have them small enough for two people or big enough for four or five. And they really are as good a duckling as you’ll get, with a particularly meaty breast. We get them in from France in the middle of December, freeze them immediately and have them available for you to thaw out yourselves. We dare not risk ordering them from France at the last minute as we have been let down in the past. (We also do this with the Guinea Fowl, large corn fed chickens and free-range chickens). Most of our game is shot in Dorset (but not the Grouse which come from the Borders), then hung and prepared either by us or locally. Nowadays, people don’t like to hang their game as they once did – until the neck broke! We hang ours for about a week to ten days which tenderises it and gives it some gamey flavour. If you like your game particularly gamey, just ask us to hang it for a bit longer, but give us some notice! Pheasant Breasts and Pheasant thighs (ideal for making your own confited pheasant) are now available.